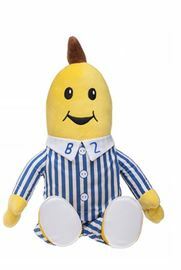 67.39% of people buy Bananas in Pajamas Classic Beanies - B2 and Bananas in Pajamas Classic Beanies - B1. Collect both of these fun-loving twins! Sporting their signature blue & white striped pyjamas, their plush yellow fabric is filled with beans to withstand lots of play! Enjoy this new classic design with stitched facial features.